Yes, the movie’s back on again, with Barry Levinson slated to direct. 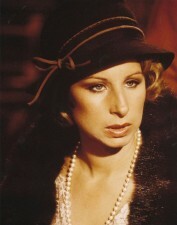 Five reasons to worry: 1) Streisand will be the real director: how long will Levinson last once shooting starts? 2) She wants her 49-year-old son, Jason Gould, to play Herbie; 3) The digital enhancement required to make the 73-year-old Barbra look thirty years younger (the age of her character, Mama Rose) will take at least 5 years in post-production; 4) When Barbra’s movie “The Mirror Has Two Faces” opened, the NY Times critic Janet Maslin memorably wrote, “Streisand directs with a gun to the camera’s head”: will she direct “Gypsy” with a gun to the computer? and 5) Will anyone under 50 go see this, even if Zac Efron is Tulsa and Ryan Reynolds is Herbie?